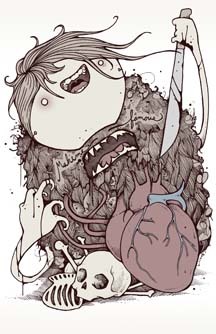 Chris Bodily’s illustrations are simultaneously raw, funny, messy, cartoonish, and heartbreaking. A big goofy monster holding prescriptions and wanting his heart to be seen with allusions to happiness scribbled on the wall says volumes about the human condition, his and ours. He wants us to take a closer look. Chris has struggled with heavy realities in his life: the early loss of a parent, the suicide of a beloved friend, and his own battle with a fragile nervous system that requires balance, rest, and stability for him to function. Much of Chris’ work was cathartic. He refers to 2 years ago as “rock bottom”. Rather than giving in to the psychological demons, he put it all out there as a self-portrait. “It doesn’t have to be pretty or polished to have value,” he states. “Each viewer will take away something different. The communication between me and the viewer is a combination of melancholy and humor.” His illustrations are like a journal, enabling him to heal through his work. Chris has found a balance in his work and is a happy as he’s ever been, eschewing artistic ego and jealousies or obsession with fame, saying “Be passionate, focus on what you create. Everyone’s perception is valid.” Chris will continue to put his heart in his work and be his endearing, funny, imperfect, talented self. His career is thriving; freedom and autonomy are his greatest rewards. Chris Bodily’s work is online at hatrobot.com and will be showcased at Blonde Grizzly Gallery on August 16th, 2013.